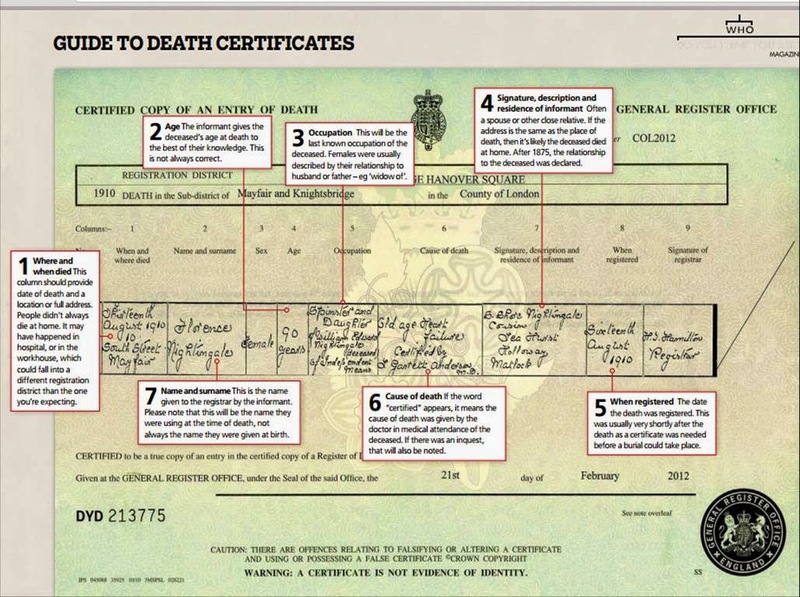 Death records often add texture to a life and can reveal other members of the family. 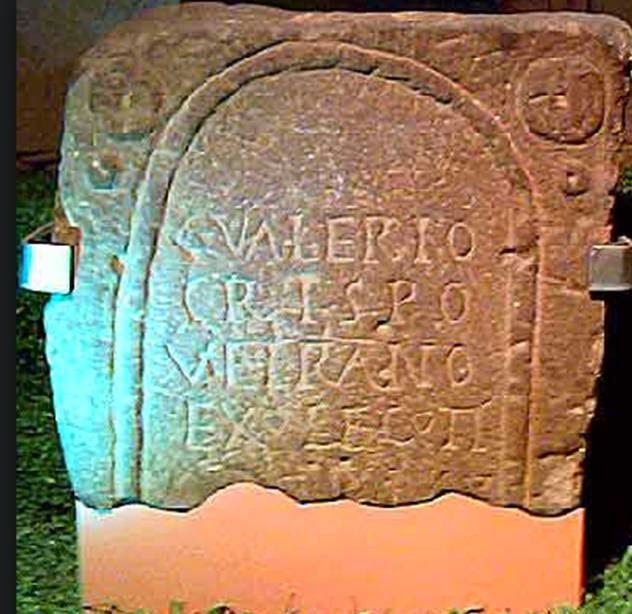 The earliest records were those of nobility and private citizens, which stretch back at least to the Roman times with inscriptions on tombs. Through the Middle Ages the deaths of notable individuals were recorded, whether deaths through battle, accident or injury. However, there was no systematic recording and it is generally luck if any ancestor was recorded in this way. 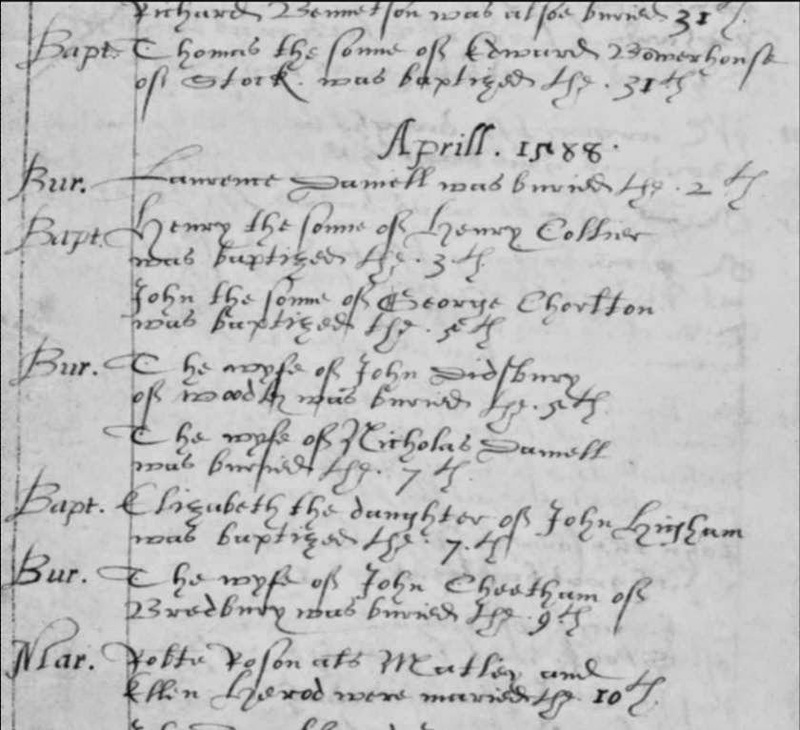 The first systematic recording of names occurred after 1538 when Thomas Cromwell ordered that each parish should keep a parish register in which should be kept all baptisms, marriages and burials of the previous week. Thereafter deaths were recorded, though the survival rate of the registers (especially during the Commonwealth) is variable. The script is readable, but takes a while to 'get your eye in'. The left hand column indicates whether the entry is a baptism or burial. 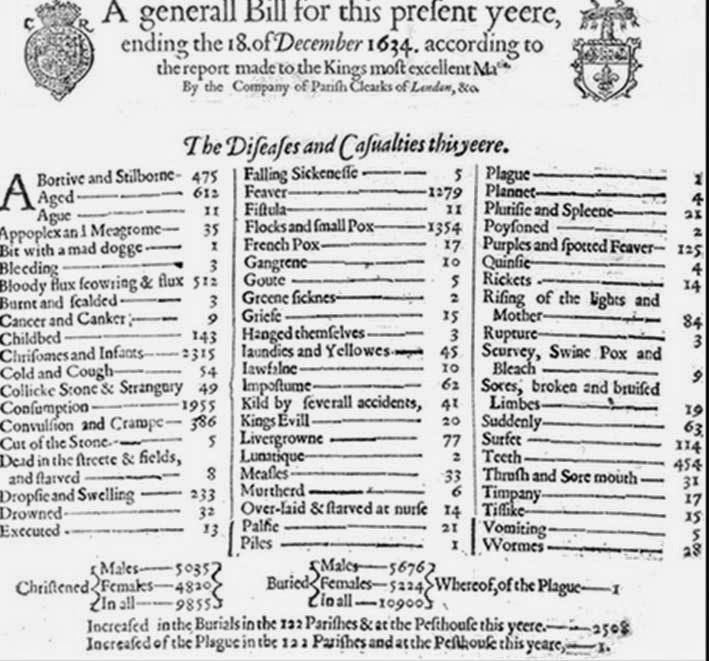 The first systematic attempt in England to statistically analyse the number of deaths come from the Bills of Mortality, which during the 17th Century detailed the numbers of deaths in each of the London parishes. The Bills of Mortality are interesting in their own right, but also for the types of deaths, such as the 28 who died by 'Wormes', 454 because of 'Teeth' (ie tooth ache), 41 unfortunates who died 'Kild (ie Killed) by severall accidents' and the 8 who were found 'Dead in the street and fields and starved'. Parish registers continue to be the only local source of death records, with the format remaining more or less the same, though over time extra details, such as age, could be recorded. Then in 1837 the system completely changed with the state taking control of the process and issuing standardised forms to be filled in. Apart from the age, the most interesting can be the cause of death, but often the details of the 'informant' can give additional family history details. The required reference numbers are in the main indexes, which are online on all the main genealogy sites, and on FamilySearch which is free. Once the reference number has been found, the actual certificate has to be ordered from the GRO. each of which will be written about in subsequent posts. Some organisations - notably FamilySearch - offer information for free, whilst others offer the information, along with a great many other records, as part of a subscription or credit package. 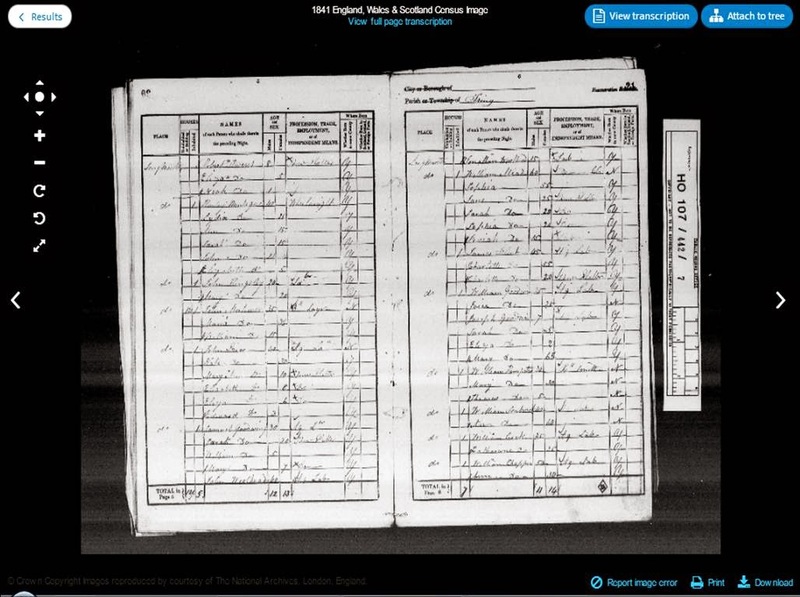 The 1841 Census is the first national UK to record the names and addresses. It is this fact that makes it so important for family historians. The census covered England, Wales, the Channel Islands and the Isle of Man, but not Scotland or Ireland which had different censuses. 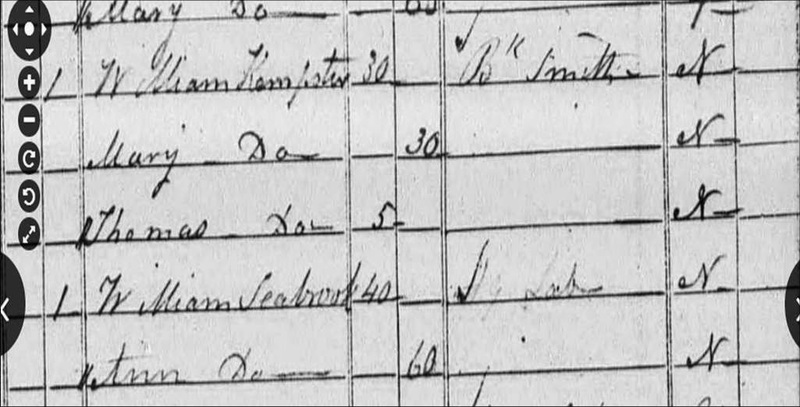 If someone on the census was 80 at the time of the census then the person and family instantly gets taken back to 1760. However, there is a major omission on the census - the place of birth. The 1841 census only records whether the person was born in the same county as they were then living, or in Scotland, Ireland or Foreign Parts. It is desperately frustrating to have a 'N' (No) as there is then no indication of where the person was born. Even if the answer is 'Y' (Yes) then for a very large county such as Yorkshire it can be immensely difficult to find the correct parish. (The place of birth is included in the 1851 Census). 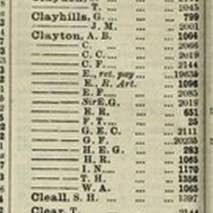 The 1841 Census was taken on 6 June 1841 and collected the name of everyone at the cited address on that night. It was the fourth national census. The previous censuses, which started in 1801 - and every ten years thereafter in 1811, 1821 and 1831 - just collected the numerical figures for the number of people in households or occupations. Just occasionally local enumerators added the names of people and so a few more detailed records survived, but these are few and far between. For the 1841 Census each householder was required to complete a census schedule which contained the household address and the names, sexes, occupations and places of birth of each person living at the address. In the 1841 returns ages of persons over 15 years were generally given only to the nearest five years; in 1851 exact ages were returned. The census schedules were pre-printed and then left with the householder to fill in and were collected later. The enumerator collected the information if there was no-one in the household who could write. 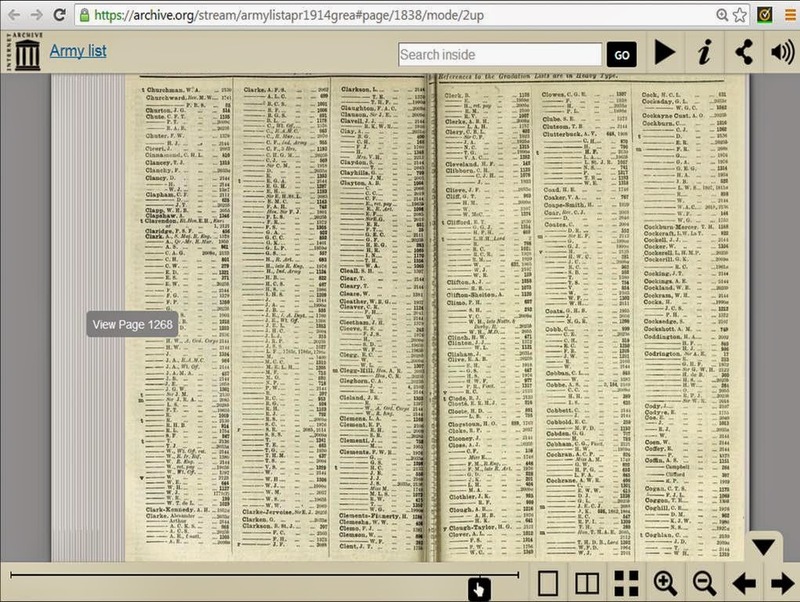 There is also a third stage for the modern researcher - the transcription from the Books into the computer which now make up the transcriptions for Ancestry, Findmypast etc. The following example is taken from the Findmypast census collection and involves a search for the Seabrook in Long Marston, Hertfordshire in 1841. Clicking the 'image' icon gives the original - which can be vital if the transcription is wrong (normally because the original is unclear). The original looks very unclear and faint (and many are, especially in the 1841 Census) but thankfully the image can be zoomed and the information can be seen clearly, with the entry for Ann at the bottom ('Do' means 'Ditto' ie the 'same as above'). 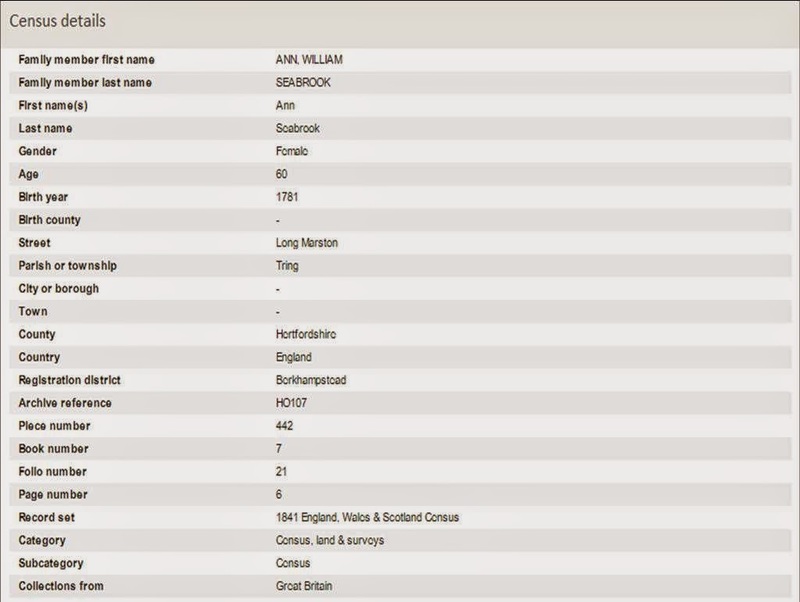 Although not stated, I assume that Ann was William's mother (though this would need to be checked) and William was unmarried at this point. He is described as an 'Ag Lab' - ie Agricultural Labourer, which generally indicates poor and unskilled. 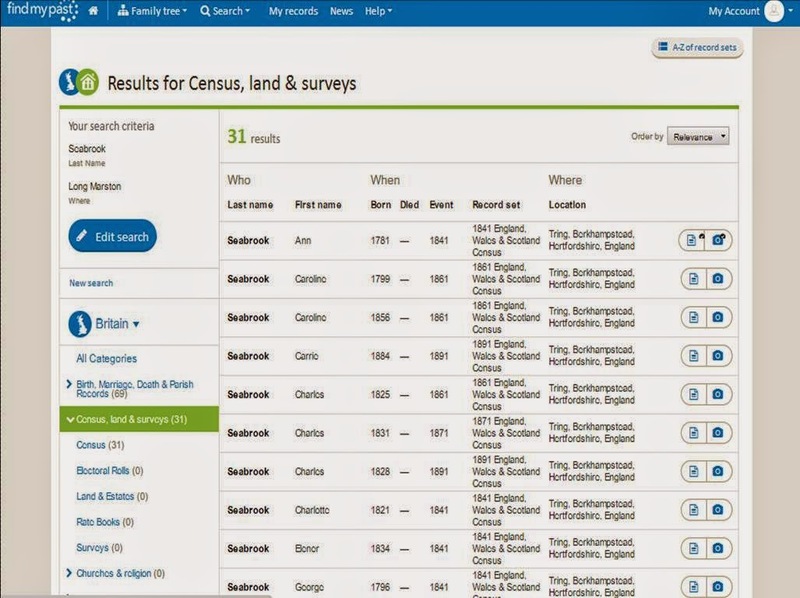 All the major genealogical websites have the Census returns for England, Wales etc but only Scotland's People and FamilySearch contain the Scottish Census returns. This is the most commonly issued WW I medal - to over 6,500,000 men (a more specific number given on one website is 6,610,000). Approximately 4,700,000 medals were for distribution at home and another 600,000 for the Dominions and Colonies. There was a hierarchy of medals as the silver version was issued to 6,400,000 people and the bronze version of 110,000 was issued to the Chinese, Maltese and Indian Labour Corps. 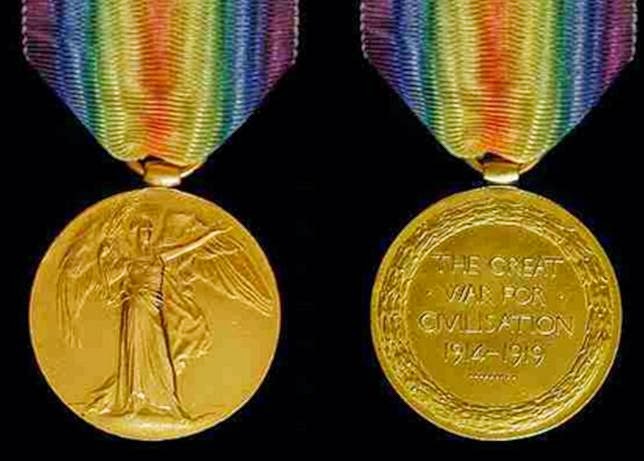 The medals were awarded to officers and men of the British and Imperial Forces who were in service between 5th August 1914 and 11th November 1918, who served either in a theatre of war or served overseas, but to receive it the person must have left British shores. The medal was established on the 26th July 1919, but later those men who served in Russia and Serbia in 1919 and 1920 were included. The front showed the head of George V, and the recipient's service number, rank, name and unit were on the rim. On the reverse is an image of St George. The ribbon has a central band of golden yellow with three stripes of white, black and blue on both sides. The soldier's regiment and number were inscribed round the rim. The Victory Medal was issued by each of the victorious Allied countries and the British medal was designed by William McMillan (who, incidentally, died in 1977). On the front was a Winged Victory in a classical pose and on the reverse was the inscription 'The Great War for Civilisation'. The medal was in bronze. All three services were eligible, including women for their service in nursing homes and auxiliary forces. It was also awarded to the British naval mission to Russia (1919-1920) and for mine clearance in the North Sea between 11 November 1918 and 30 November 1919. The 1914-15 Star is the next medal that was awarded. 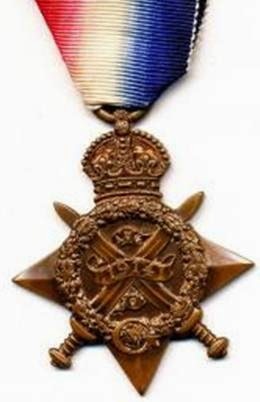 The 1914 Star / Mons Medal was awarded to those people who saw active service from the opening of the war on 5th August 1914 to midnight on November 22 1914.
Notable inclusions for the awarding of the 1914-15 Star included those service personnel who fought at Gallipoli (25th April 1915 to 31 December 1915), in Egypt, and the capture of German Samoa on 29 August 1914. However, a person could not hold both the 1914 Star and the 1914-15 Medal, so if the person had the 1914 Star Medal they would not receive the 1914-15 Medal. The cut off date for the award of the 1914 Star was midnight on the 22nd November 1914. The reason that the 1914-15 Medal was awarded was that conscription started (under the Military Service Act 1916) on the 2nd March 1916, which stated that any man aged between 18 and 41 could be called up for military service. 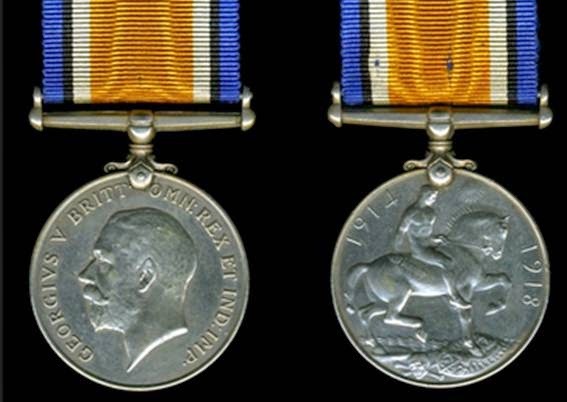 The 1914-15 Medal therefore recognised the men who had volunteered before conscription became compulsory. There were various exemptions (including, at first, married men) but over time the exemptions became fewer and fewer. There are various estimates of the numbers awarded, with 2.35 or 2.4 million and the more precise 2,078,183 all being given on various websites. The design was identical to the 1914 Star (though the words Aug and Nov were omitted and the scroll across the centre had the dates 1914-15 Star added). The ribbon is also identical to that of the 1914 Star, being red, white and blue stripes on watered silk. Also like the 1914 Star the soldier's regiment and number were inscribed on the flat face on the rear of the Star. On the Medal Cards the 1914-15 Star was often written 15 Star in the stamped box (top right) and could also be described in the hand written text below (in this case in the section 'Action Taken'). 4) So commonly known that they don't appear in any list. 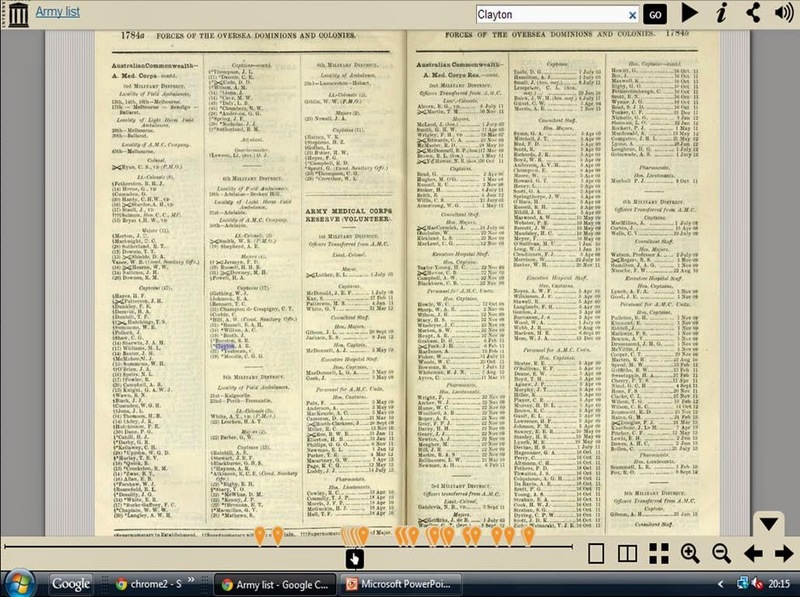 The first - the National Archives - is Medal index specific, but most are similar lists. These can be difficult to track down and often specialist help is required. There are some abbreviations that are so 'obvious' that they do not appear on any lists. 'Obvious', that is, unless you don't know them. So for example there are the abbreviations in the Army List of 'R Art' and 'R Mar'. These don't appear in the standard abbreviation lists indicating that they are either very obscure of very common. Googling the terms indicate they are very common. And it is these are abbreviations which, once you know them, are 'ah-ha' moments, for of course they mean 'Royal Artillery' and 'Royal Marines'. One of the best sources of information about army officers (unfortunately it is only officers, and not all ranks) are the Army Lists. These were produced regularly from the early 19th century and by the time of the First World War were an established feature of the army records. 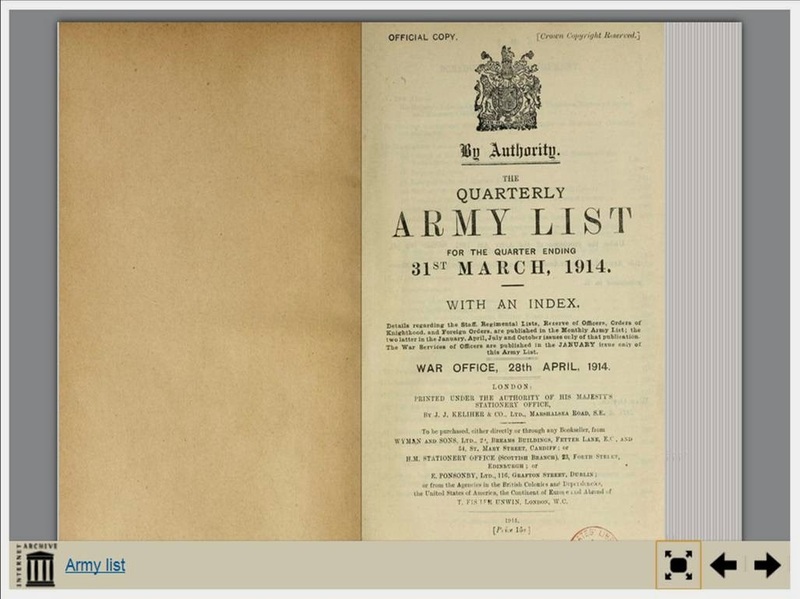 There is an excellent - free - resource of Army Lists at Archive.org. The First World Army Lists are the Quarterly volumes. 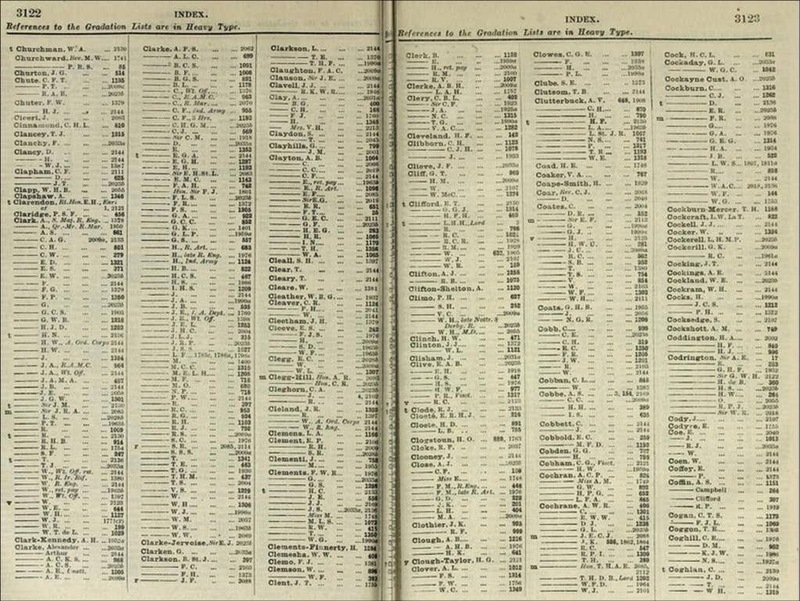 There were also monthly volumes which had slightly different information in them (see below). The Army Lists ran to different numbers of volumes with up to three volumes as the number of officers increased as the war progressed. 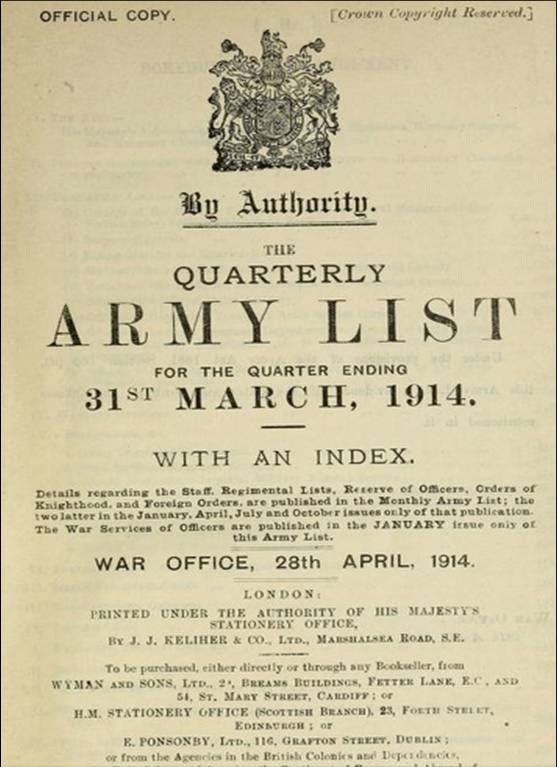 This is the title page of the Army List for January to the end of March 1914. 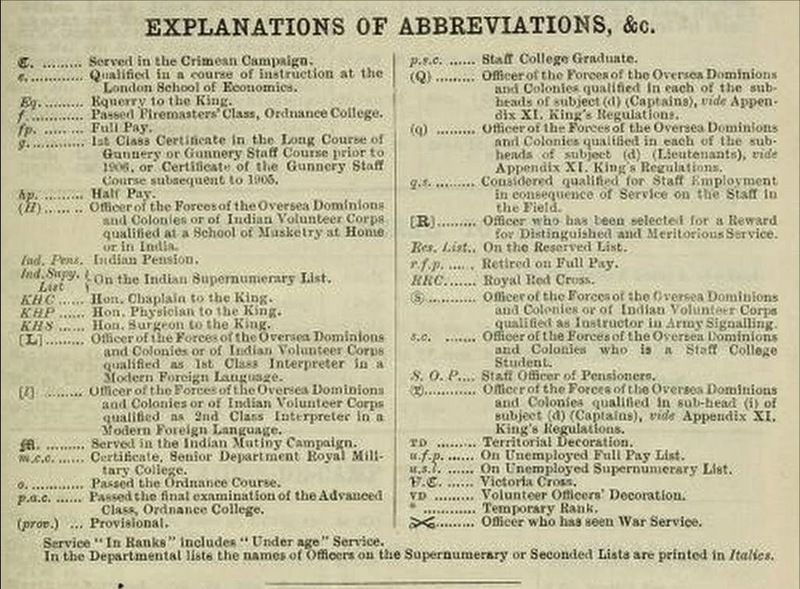 The smaller writing under 'With an Index' gives important information about the different types of Army List and what they contain. The latter two (ie Orders of Knighthood and Foreign Orders) in the January, April, July and October issues only of that publication. 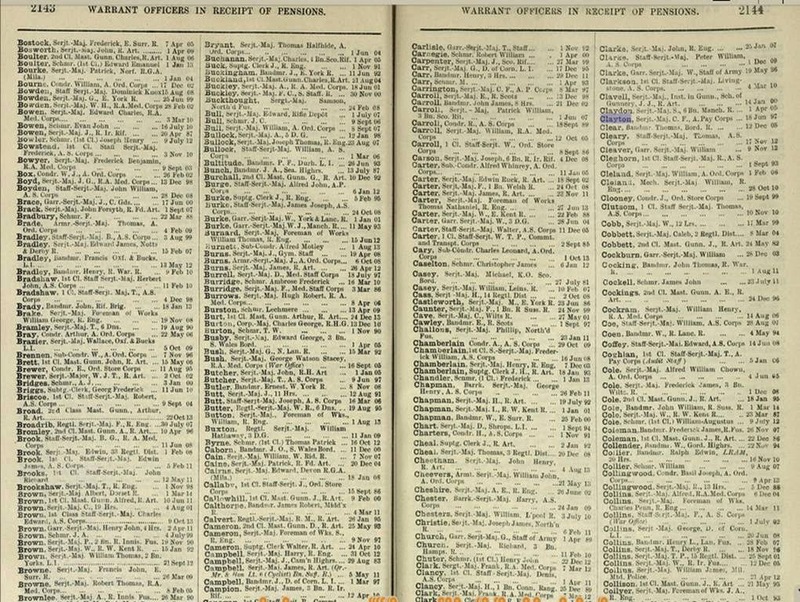 The War Services of Officers are published in the January issue only of this Army List. Notice that index numbers go further than the total page numbers. This is because within some of the lists there are several columns per page and each column is referenced in the index, or some pages have more than one page number. The following screen shows the standard archive.org screen setup. Click the page expansion button (bottom right, next to the back or left arrow) and the following style of screen appears. The pages can be found either through placing the cursor on the pages on the left (or right) hand side which indicates the page number, or by moving the hand at the bottom along the line. However, a warning. As noted above the numbers in the index are not the page numbers, so there is an amount of narrowing down the page numbers until the correct one is found. Alternatively, use the search box 'Search inside' to search for the names - the instances are shown on the 'hand bar' below. Searching of 'Clayton' will give all instances of the word. 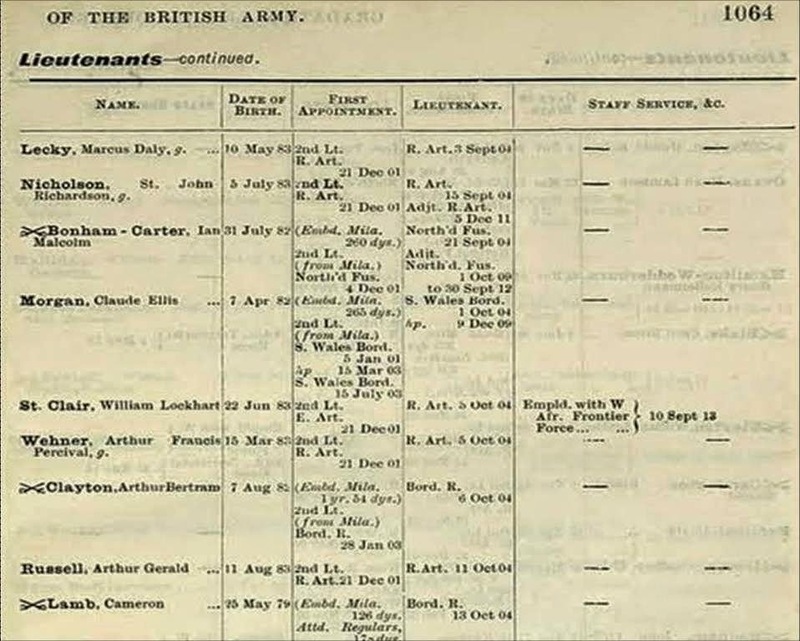 The top heading shows that he is a Lieutenant and then the columns give the relevant information, including Date of Birth and First Appointment. The crossed swords by his surname shows that he has seen previous action. 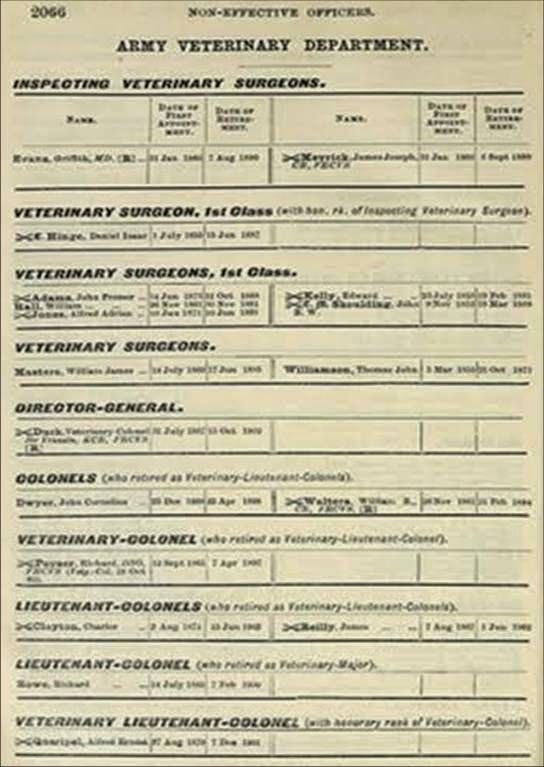 The second page shows the Army Veterinary Department. Note that the page numbers in this section have the number, and then pages number a), b), c) and d). Another section is the is Warrant Officers in Receipt of Pensions, with helpfully the date when the pension was first received. There are of course many other sections, but this gives a flavour of the sections within the Army Lists. And finally ... there is one aspect that needs explanation - abbreviations, of which I have written a separate blog. As it is approaching the now famous 'Christmas truce' and the football match between the English and German soldiers fighting in the muddy and cold trenches along the front line, it is a good time to reflect and look at 1914 Star - the campaign medal for the opening months of the First World War. With war brewing for the months before its opening campaigns in August all sides had had a chance to prepare for war. The German grand plan (known as the Schlieffen Plan after the German General who had devised it) was to go round the army and defences which France had been building up along the German border in preparation for another war against Germany. The Germans took advantage of the lack of French forces along the Belgium border and attacked through Belgium. As Belgium's neutrality had been guaranteed by Britain, the British sent units of the BEF (British Expeditionary Force) to Belgium and France in early August. The opening campaign was a crushing victory for the Germans and whilst there were moments of heroism by the British forces, the allied forces were pushed back in an action known as either the Great Retreat or the Retreat from Mons. The Allied lines were finally stabilised about 200 miles from their original positions along the Rivers Marne and Aisne. With the lightning strike on Paris not now feasible, the German army raced to Channel coast, both to seize re-supply ports, but also to try to out-flank the Allied lines. One area which stood between the Germans and the sea was the higher ground round the Medieval city of Ypres (or 'Wipers' as it became known to the English). The First Battle of Ypres (there were four in all) was the result of a massive German attack along a long front, which the allies managed to halt and hold the line. It was a significant defensive victory and meant that the Germans could not encircle the Allies nor gain significant Channel ports, such as Calais. The early days of very mobile warfare had passed and by Christmas defensive trench warfare had become the norm. It was from these trenches that the soldiers emerged at Christmas to play their famous match. There are a great many sources for the background history of First World war (Wikipedia is a good starting point). 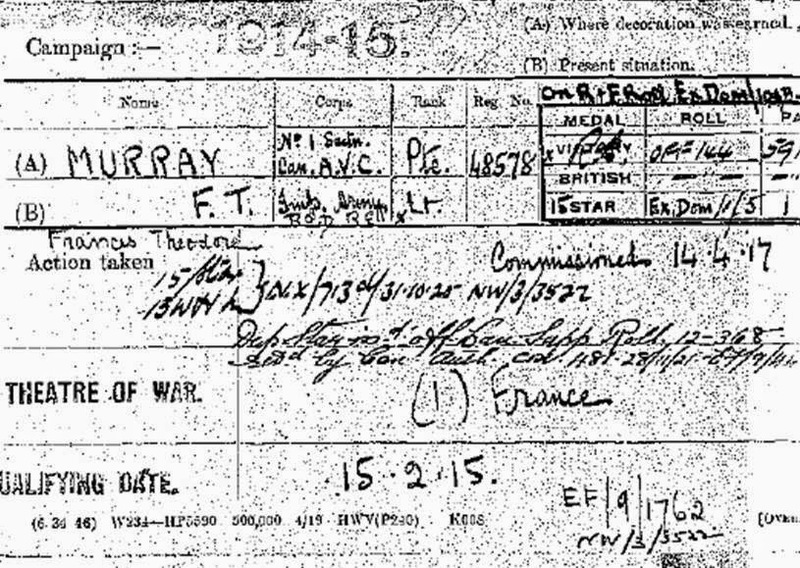 For family historians a key record for the early weeks of the war is that regarding the awarding of the Mons Star medal. The Mons Star was the nick name for the correctly named '1914 Star'. The same medal could also be called 'Pip' - as it was often awarded with the British War Medal and the Victory Medal - the trio of which were called 'Pip, Squeak and Wilfred'. 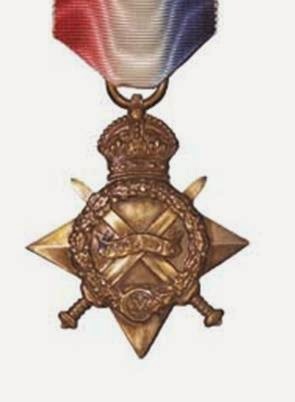 The 1914 Star was awarded to servicemen and women and civilians of the British and Indian Forces who saw service in France and Belgium between the 5th August and 22 November 1914. Any personnel arriving on the 23rd November or later were not eligible for the 1914 Star, but where awarded the 1914/15 Star (which will be covered in a later blog). As well as the Army this included the Royal Navy, Royal Marines, Royal Naval Reserve and Royal Naval Volunteer Reserve The 1914 Star was authorised in April 1917 by King George V. In all 365,622 Mons Stars were issued. Whilst the front was ornate, the reverse was plain to allow for the inscription of the recipient's service number, rank, name and unit. In 1919 a bar (ie another medal of the same type) was sanctioned with the inscription "5th Aug-22nd November 1914". The 1914 bar was only awarded to those who had actually been under fire during the specified period. As the same ribbon was used as the later 1914/15 Star, to differentiate the 1914 and 1914/15 Star holders of the 1914 Star were permitted to wear the ribbon with a small silver rosette. this was often noted on Medal cards as the 'Clasp and Roses' or 'C&R'. This was not sent out unless applied for. These have not been digitised but can be seen at the National Archives and copies can be ordered. Individuals can be searched for my name. which includes the Royal Marines. 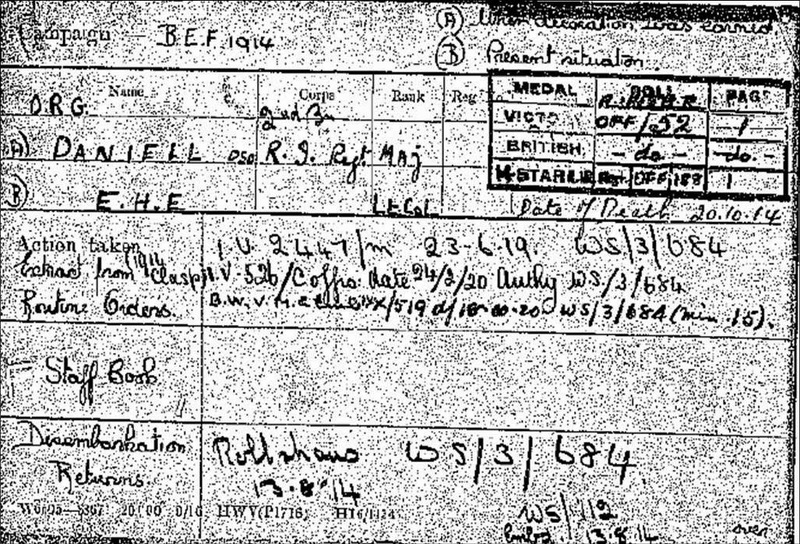 Medal cards also list those men who were awarded the 1914 Star as in this example in top right quarter of this medal card where it is written '14 Star'.